BMW's electric i3 Golf rival revealed | What Car? This is the first look at BMW's new i3 Golf-sized electric car, which goes on sale in 2013. It's the first model for BMW's new high-efficiency 'i' sub-brand and follows on from the Megacity development project. Our computer-generated image is based on models that BMW revealed when it launched the brand, and gives a clear idea of what the car will look like. 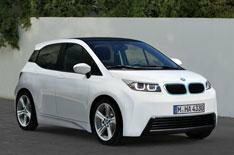 The i3 will be a four-seat, rear-engined electric car with a 100kW motor, and will have a range of around 100-130 miles. It is likely to cost from around 30,000. BMW will also launch a high-performance sports car called the i8 in 2013. The diesel-electric hybrid is based on the Vision Efficient Dynamics. Although it develops 328bhp, and can accelerate from 0-62mph in 4.8 seconds, it averages 75.1mpg and has CO2 emissions of just 99g/km.